8 Cute Green Bicycles for Women! It’s my most favorite color in the whole wide world! 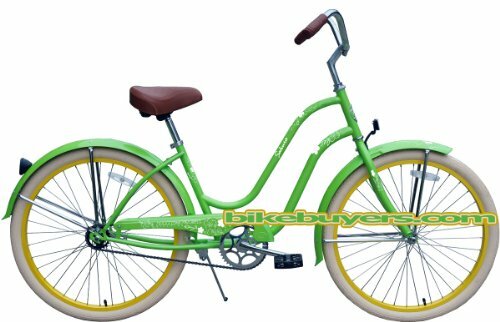 I decided to create this fun page displaying my favorite green beach cruiser bikes for sale! They are all gorgeous, ultra-fun and of course, GREEN! Look at this gorgeous green cruiser bike for sale! Just by looking at it makes you want to get off the couch and go for a fun bike ride! That’s the power of bright colors! Green makes me think of the outdoors, nature, trees, water, sky and everything good! A girly buyer said she loves this bike! It is the perfect 7-speed green cruiser bicycle! 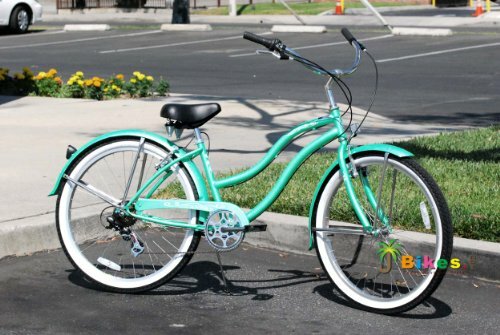 This gorgeous mint green and white beach cruiser bike looks so comfy and so smooth to ride! It is a Shimano 3-speed bicycle with coaster brakes. Perfect for a fun and not so fast bike ride! The white seat is large and comfortable and the handle bars have a very nice grip too! Overall it is a very cute bicycle that can support riders up to 220 lbs. I’m sure it will not disappoint! 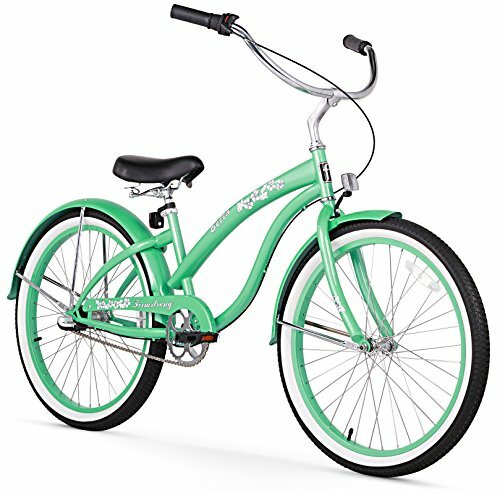 I had to show you this apple green beach cruiser bicycle for women! Will definitely make you stand out when you ride it! I also love the pink color on the wheels! This cute bike will arrive partially assembled in the box! All you (or your husband) will need to do is to install the handle bars, pedals, front wheels and the seat! After that, put on your favorite pair of sneakers, grab your girly helmet and have fun! 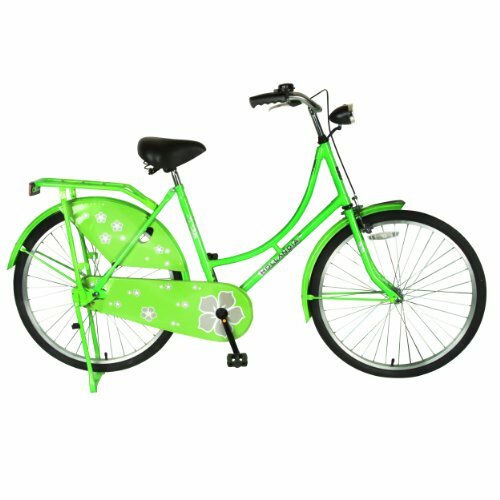 Check out this cute and girly mint green bike with cute and girly prints on the frame! It is also a high-quality 3-speed Shimano bicycle! That means you will be able to ride fast if you want! Very sturdy, easy to put together, delightful to ride everywhere! Great spring or summer gift idea to daughters and wives! 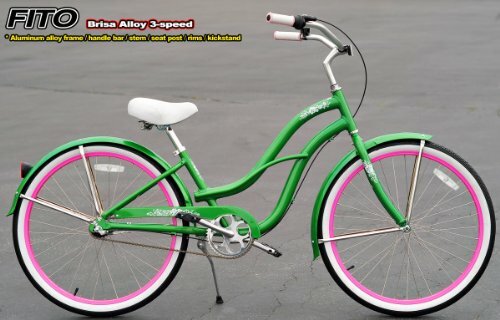 This one is definitely among the cutest green bicycles for women from this page! I LOVE the retro look and the very unique green color! The seat is very large and very comfy! It has practical and easy to use coaster brakes and it also has a few girly decals too! I love, love, love this bicycle! 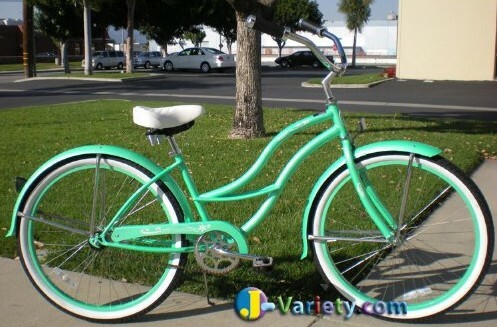 How fun and gorgeous is this green beach cruiser bike ladies? Doesn’t it make you want to go ride it right away? Of course the beautiful sunny day is also very inviting! That’s why I like cute bicycles so much! They inspire you to want to go outdoors and exercise! 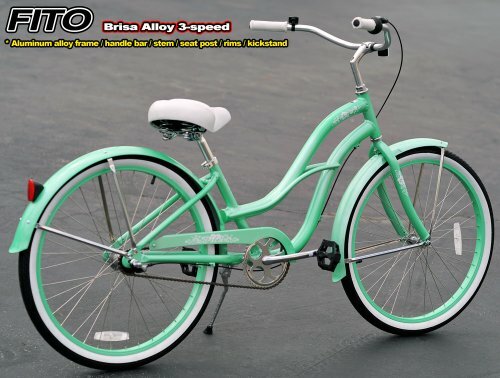 A girly rider said it is a very smooth bicycle and everyone gives her compliments on the color! Here I present to you one of the girliest green bicycles ever! This super cute green Dutch bike! Check out the flower prints all over it! Looks just like the bikes in Amsterdam! And lastly, look what I just found! 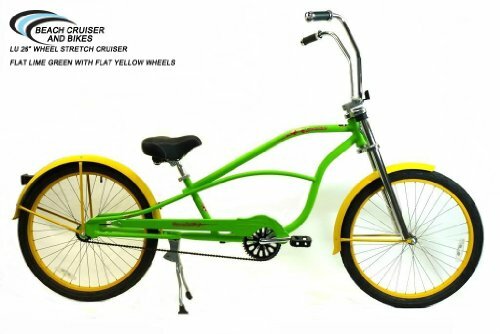 A gorgeous lime-green color stretch cruiser bicycle for sale! These are literally ‘head turners’! Everyone always turn their heads to see folks riding these cool stretch bicycles! This one will definitely stand out from a distance with such fun, bright colors! Cute Cruiser Bikes for Women!